Strong pro-life voice: Queensland’s new LNP senator Amanda Stoker delivers her maiden speech. NEW Queensland LNP senator Amanda Stoker predicts “terrible consequences” if euthanasia becomes law, and is determined to stand up in parliament for her pro-life, Christian beliefs and the right to religious freedom. “People in this building should be standing up for the fundamentals – like the right to live,” Senator Stoker, a Brisbane mother-of-three and a lawyer, said. After delivering her maiden speech in Federal Parliament last month, she admits “it was quite disturbing” to sit in the Senate chamber one day last week as business unfolded, including a push to overturn a 20-year-old law stopping territories from enacting their own voluntary euthanasia legislation. On the same day, there was a referral to remove the Lord’s Prayer from the opening of each day in Parliament. 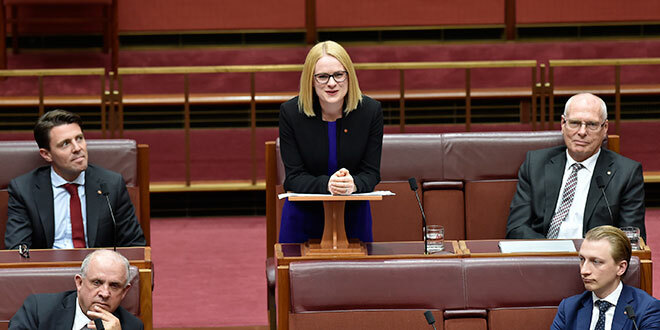 “These are distressing trends and highlight the need to have people who are confident in their faith, who value its contribution to broader society,” Senator Stoker said. She describes the political push for allowing euthanasia as “dangerous and very sad”. “The very first right of all of us is life,” Senator Stoker said. “Sometimes life is difficult, challenging, illness can be frustrating and it can push the will, but ultimately our duty is to make life as comfortable and viable as it can be, not to simply end it. “I worry about the vulnerability, particularly of older people, to abuse. A well-known face at pro-life street rallies in Brisbane, Senator Stoker said it was important to put the case against decriminalising abortion “in a way that is meaningful for people who think differently”. “I usually start from this perspective … the measure of society is how it treats those who are vulnerable,” she said. 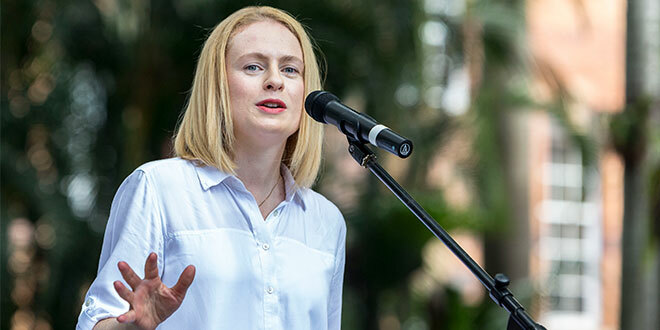 Support life: Incoming Queensland senator Amanda Stoker speaking at the March for Life. Photo: Alan Edgecomb. Senator Stoker, an Anglican who attends church in inner city Brisbane, is the 99th woman to enter the Senate. She already has some barbed observations about parliamentary behaviour. “Sometimes I think it’s a bit of a zoo, particularly in people putting on a performance in question time, but ultimately you’ve got to work to your own style,” she said. Senator Stoker defended freedom of religion. “It is deeply troubling to have so many examples to point to that suggest this freedom is under attack in our culture,” she said. On the education system, the new senator said some teachers complained about parents failing to properly prepare their children for starting school. “When I hear a teacher lament that children in their class are starting school without toilet training, I think of this disconnect,” she said. “Hard-working and dedicated teachers are saying they just can’t get the parents of a struggling child to spend some time with them helping to get their reading up to scratch. I find this sad. Senator Stoker also spoke up for young out-of-work Queenslanders, especially in the state’s outback where the unemployment rate was more than 50 per cent. She claimed the solution lay in lowering taxes to create jobs. “It’s not rocket science: reduced corporate taxes lead to higher investment, investment leads to more job creation, and the tightening of the employment market drives wages up,” Senator Stoker said.